Now this article might look like I am legislating bad hiring practices, but I am not; I realize that rushing anything, including hiring, usually ends up producing less than optimal results. However, I am just accepting the reality that many businesses face, especially small businesses, which is that many face emergencies where they lose critical talent suddenly and need to replace them fast. But employers should be aware that an NBRI study has found that the top reasons for companies making bad hires, (accounting for 43 percent of all bad hires), is down to the company rushing the hiring process. The price of a bad hire is more than just annoyance though, as the study revealed that bad hires could cost companies anything from $25,000 to $300,000 depending on the salary and grade being hired for. So, if you are going to hire in a hurry (for whatever reason), what steps can you take to mitigate your risks? I have set out several steps below. 1. Promote from within. 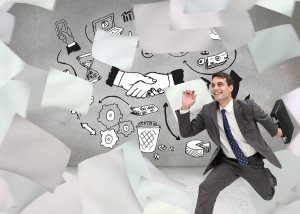 If you are forced to hire in a hurry, you should at the very least attempt to promote from with within as studies show that external hires get significantly lower performance evaluations for their first two years on the job than internal workers; they have higher exit rates; and they are 18- to -20 percent more expensive. So, to reduce the risk of something going wrong when hiring quickly, hire internally where possible. There is an added risk of over promotion, so be sure to mitigate that risk by giving internally promoted employees a grace period so they can back out and return to their old role if things don’t work out. 2. Divide the responsibilities among team members. When a person leaves, you may find that he or she wasn’t not doing as much as you assumed. Perhaps some of the tasks/responsibilities can be divided among existing team members, giving them the opportunity to increase their responsibilities, grow their role and perhaps earn more money. This can be a temporary or permanent arrangement depending on the current situation. 3. Outsource some or all of the responsibilities. Take a good look at the exited employee’s workload. Can any of the tasks be outsourced to established external service providers in the short, medium or long term? Outsourcing could end up being a more effective way of delivering the service or it could simply buy you time until you hire a replacement with the proper due diligence. 4. Use an interim. Consider using a temp or interim to fill in while you hire a full-time, permanent replacement. Of course, external interims can be very expensive and if money is a factor, why not consider using an internal interim, that is, moving an internal employee into an ‘acting’ role until the post can be filled with the proper due diligence? You may need to give the internal employee a financial sweetener, or a temporary salary uplift while they perform the acting role. As I have suggested, the reality is that from time-to-time you will need to hire in a hurry, and it is likely to reduce the quality of your hiring process, but these risks and issues can be partially mitigated by following these steps.